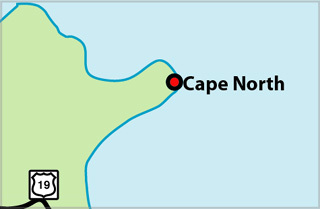 The Cape North Lighthouse stands on Money Point, about 1 nautical mile southeast of the cape. Cape North itself is a bold, steep-sided, rocky headland, with an elevation of 1,000 feet. Violent local squalls are common off this headland. This lighthouse was replaced by a skeleton tower in 2009. This panorama shows the Lightstation at Cape North before 1980. In that year the cast iron, red and white checkerboard light tower was dismantled and trucked off to Ottawa. The Director of the Museum of Science and Technology wanted to display a real lighthouse beside other artifacts such as a steam locomotive, a radar dish and an astronomy dome. 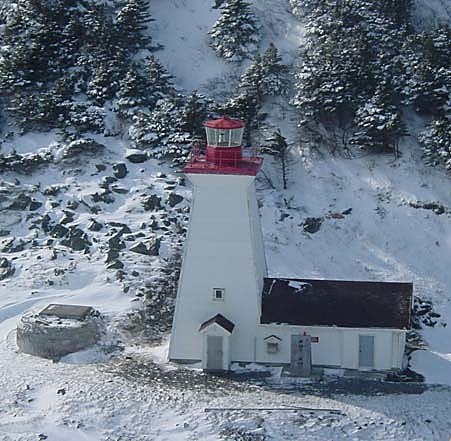 He was notified that the Cape North Lighthouse was to be replaced, and as a result, the lighthouse was installed on St. Laurent Boulevard surrounded by limestone blocks to simulate a lighthouse island. This was an incongruous final resting place for this well-travelled light tower. It started life in 1856 as the tower at Cape Race, Newfoundland, Canada's Landfall Lighthouse. In 1907 a concrete lighthouse to support a huge Hyper-radial Fresnel lens was installed at Cape Race, and the cast-iron lighthouse was sent to Money Point. Here, it retained it's red and white checkerboard paint, as it does to this day, in Ottawa. Photo - Courtesy Department of Fisheries and Oceans, The complete Cape North Lightstation before 1978. Light Height: 104ft feet above water level. 2009 - replaced by a skeleton tower, which is "Lighthouse IV" at this location.